On January 12th, 1993, Mario Lemieux dropped a bomb that shocked the sporting world: he was diagnosed with Hodgkin's lymphoma, a form of cancer that starts in the white blood cells. He had to stop playing immediately to begin treatment as the hockey, and sporting, world watched one of its biggest stars deal with something earth shattering. On the morning of March 2nd, 1993, Mario finished his final treatment. Undeterred he hopped on a plane and flew to Philadelphia, dead set on playing that night after missing 23 straight games. That night he made his return in front of a usually hostile Flyers crowd. That night would be different. Before puck drop Mario took the ice. As he skated out prior to the anthem an usual sound came from the Flyers faithful in the crowd: cheers. Loud, bountiful cheers welcomed back the best player in the NHL. 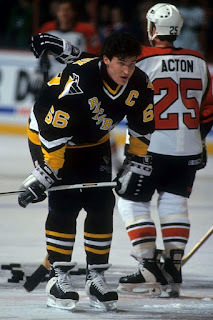 The Penguins would go on to lose 5-4 that night but with a goal Mario truly won. Not looking like he'd missed a beat, Mario returned from fighting cancer to play a total of 60 games that year and register a mind numbing 161 points. Super Mario proved super once again and defeated his greatest foe to date in doing so. Join us next week for Flashback Friday. best spotify apk premium This is the best site where you will get entertainment and enjoy with best and favourite music on spotify music streaming platform. The Mobdro Apk Download For Android This is the best site to enjoy best music in everywhere you can enjoy to download your favourite music with The Mobdro apk on android and stay happy. GEO news pakistan live| pakistan news channel live| geo tv live streaming This is the best site to enjoy pakistani urdu t.v shows and drama serial. watch the videos on GEO news and always be happy with GEO. Express News Live Urdu | Watch Express News Live | Express Tv Live Neo Tv Live Streaming Pakistan Satellite news channel provide unbiased coverage, journalistic insight on local & global socio political events via free live video streaming. NEO News Live| Pakistani News Channel Live| NEO News Live streaming online watch free This is the best site to enjoy pakistani urdu t.v shows and drama serial.You can watch news and live Headlines on NEO news and always be happy with NEO .